1. Below is info on where the event will be held, Sacramento Bar, north side of the American River. At the time of deadline to California Fly Fisher, the exact location was not decided upon for many reasons. If you ever had an interest, question or wish to ask a rod maker a question about a rod you own of his, this is a great opportunity to do just that. Thank you, and call either shop for more questions. *These dates are first come first serve so call 530-514-2453 or email hoganbrown@hotmail.com. Until just today I was completely booked up for striper season through mid September but with a cancelation and a personal trip falling through I have 4 dates open over the next two weeks. There are plenty of smaller schoolie fish around with all the big boys starting to show themselves as well. Just last week we landed 2 fish over 20lbs and saw big fish every day we were out. Great time to get out and the weather has COOLED down dramatically! Weather forecast is showing low 90s and high 80s for Chico, CA over the next week. 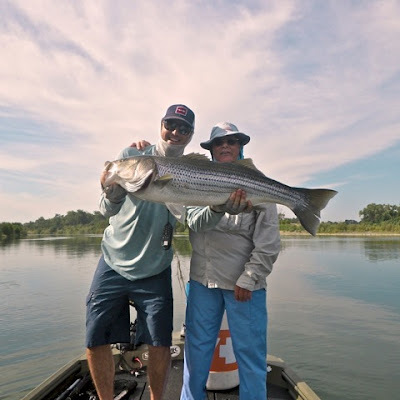 If Striper fishing isn't your thing Trout fishing on the LOWER SAC has been great down from Barge hole down with plenty of trout nymphing with stoneflies and caddis patterns.